2 英 語 特 別 講 座 代 名 詞 前 置 詞 形 容 詞 助 動 詞 #2 代 名 詞 日 本 語 私 あなた 彼 のうしろに は の を に のもの をつけて 使 う どこに 置 くかは 比 較 的 自 由 私 はジャスコに 行 った ジャスコに 私 は 行 った 英 語 私 は 私 の 私 を 私 のもの 君 は 君 の 君 を 君 のもの 彼 は 彼 の 彼 を 彼 のもの とそれぞれ 形 が 違 う 置 く 場 所 が 限 定 されている I went to JUSCO. JUSCO I went to. 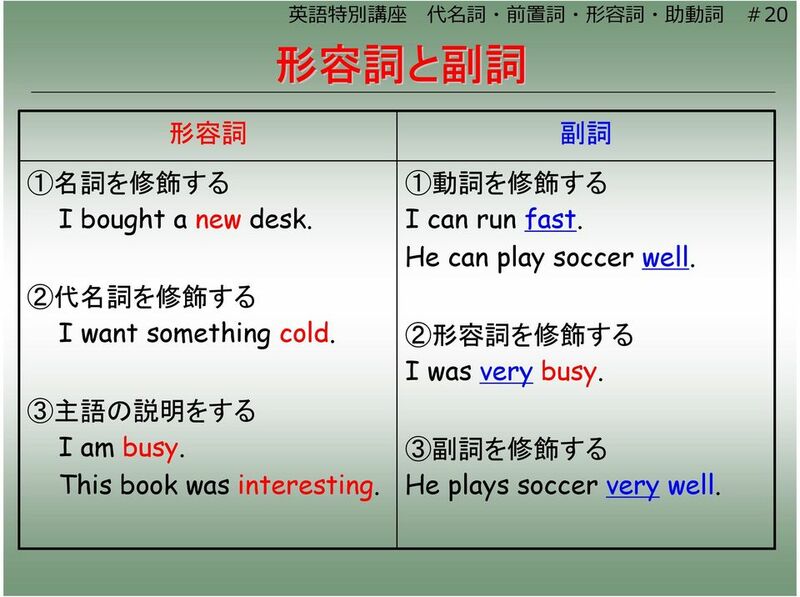 3 私 を 適 当 な 形 に 直 しなさい 1. am very busy. 2. walked to school. 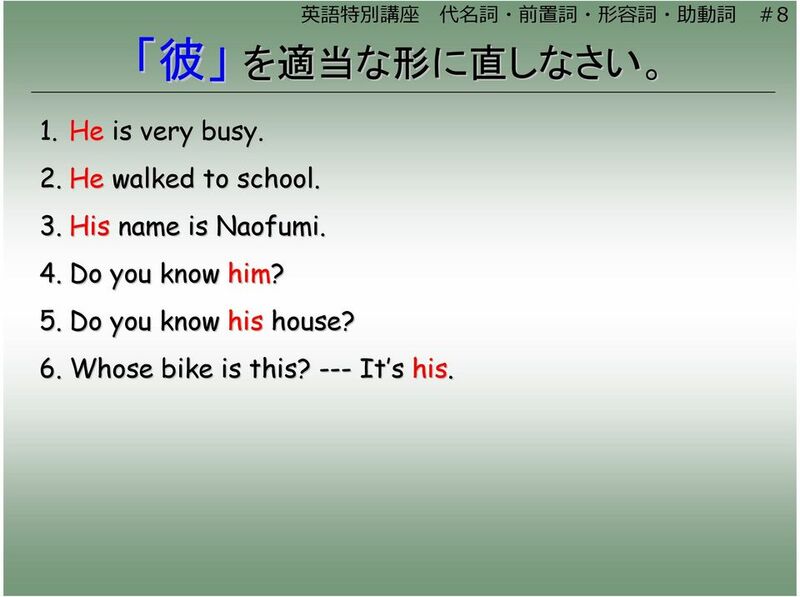 3. name is Naofumi. 4. Do you know? 5. Do you know house? 英 語 特 別 講 座 代 名 詞 前 置 詞 形 容 詞 助 動 詞 #3 6. Whose bike is this? --- It s s.
5 あなた を 適 当 な 形 に 直 しなさい 1. are very busy. 2. walked to school. 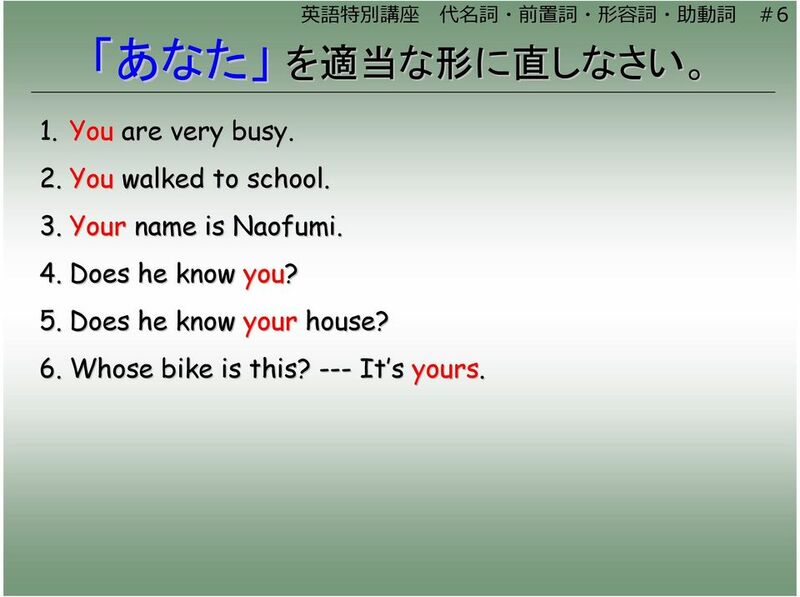 3. name is Naofumi. 4. Does he know? 5. Does he know house? 英 語 特 別 講 座 代 名 詞 前 置 詞 形 容 詞 助 動 詞 #5 6. Whose bike is this? --- It s s.
7 彼 を 適 当 な 形 に 直 しなさい 1. is very busy. 2. walked to school. 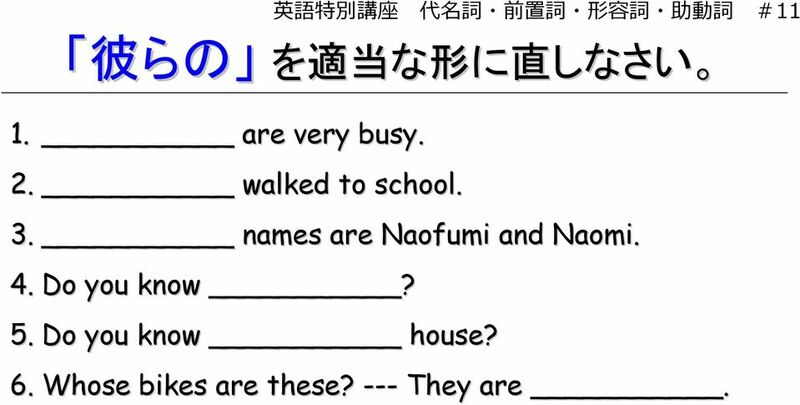 3. name is Naofumi. 4. Do you know? 5. Do you know house? 英 語 特 別 講 座 代 名 詞 前 置 詞 形 容 詞 助 動 詞 #7 6. Whose bike is this? --- It s s.
9 彼 女 を 適 当 な 形 に 直 しなさい 1. is very busy. 2. walked to school. 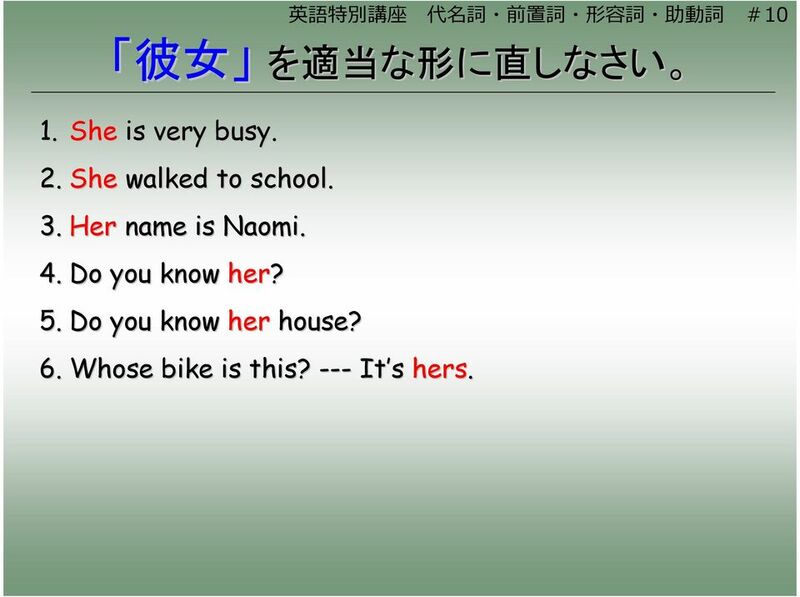 3. name is Naomi. 4. Do you know? 5. Do you know house? 英 語 特 別 講 座 代 名 詞 前 置 詞 形 容 詞 助 動 詞 #9 6. Whose bike is this? --- It s s.
11 彼 らの を 適 当 な 形 に 直 しなさい 1. are very busy. 2. walked to school. 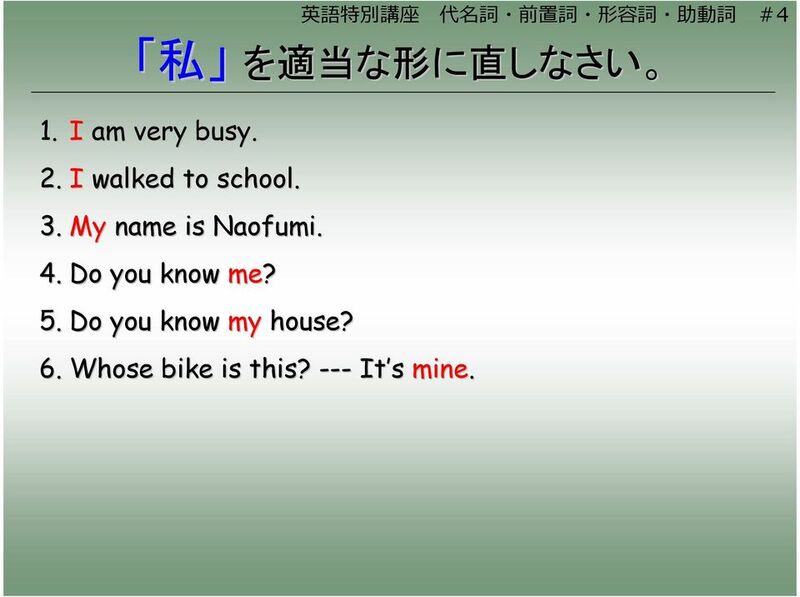 3. names are Naofumi and Naomi. 4. Do you know? 5. Do you know house? 英 語 特 別 講 座 代 名 詞 前 置 詞 形 容 詞 助 動 詞 #11 6. Whose bikes are these? --- They are. 12 彼 らの を 適 当 な 形 に 直 しなさい 1. They are very busy. 2. They walked to school. 3. 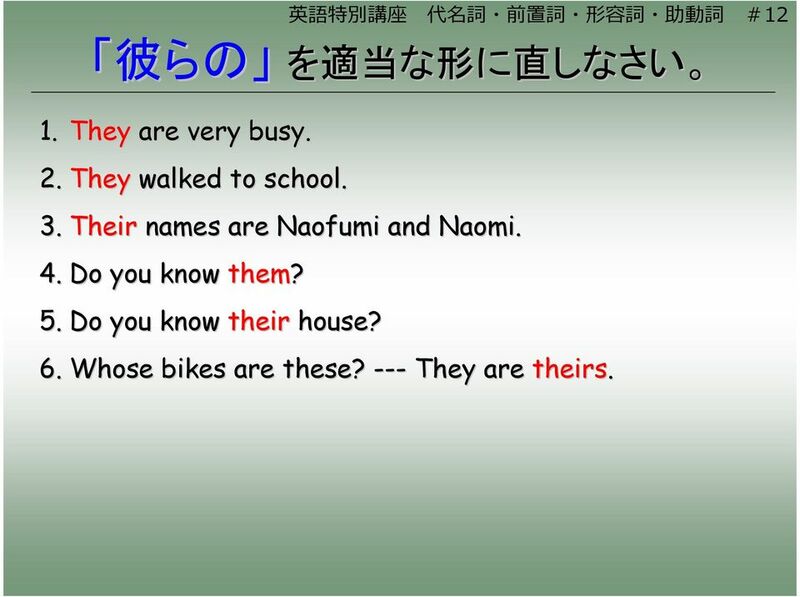 Their names are Naofumi and Naomi. 4. Do you know them? 5. Do you know their house? 英 語 特 別 講 座 代 名 詞 前 置 詞 形 容 詞 助 動 詞 #12 6. Whose bikes are these? --- They are theirs. 16 英 語 特 別 講 座 代 名 詞 前 置 詞 形 容 詞 助 動 詞 #16 時 を 表 す 前 置 詞 問 題 : at, on, in のどれかを 入 れる 1. 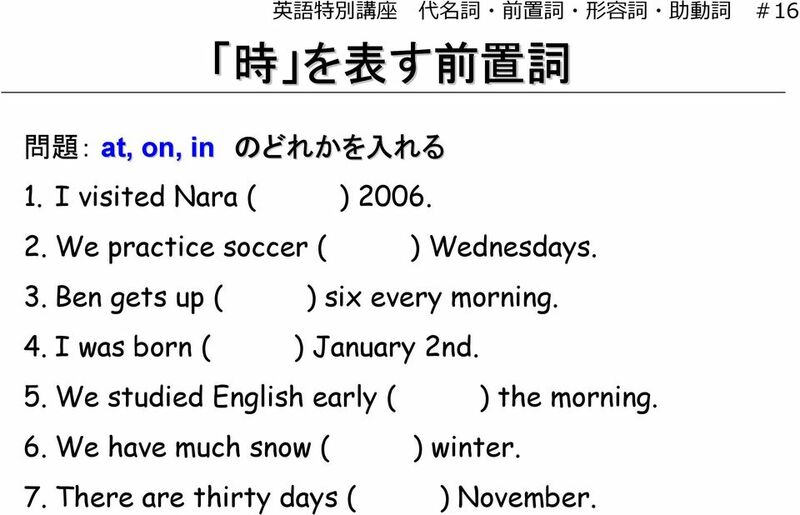 I visited Nara ( ) We practice soccer ( ) Wednesdays. 3. Ben gets up ( ) six every morning. 4. I was born ( ) January 2nd. 5. 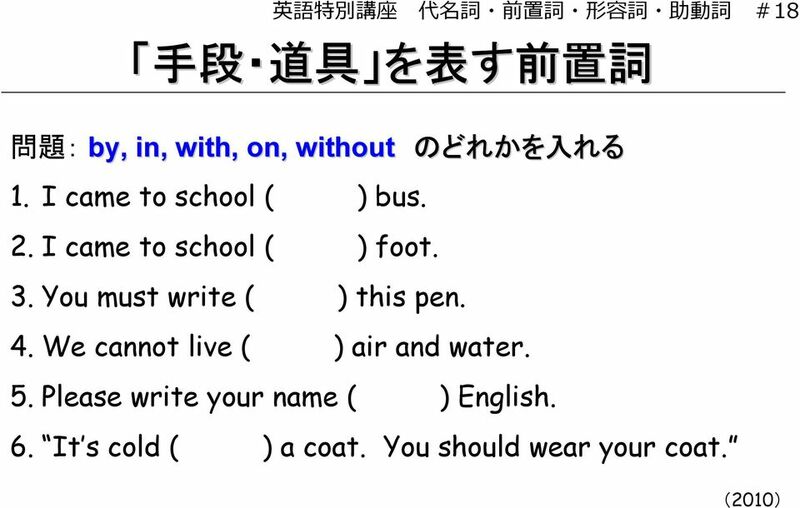 We studied English early ( ) the morning. 6. We have much snow ( ) winter. 7. There are thirty days ( ) November. 17 英 語 特 別 講 座 代 名 詞 前 置 詞 形 容 詞 助 動 詞 #17 時 を 表 す 前 置 詞 問 題 : at, on, in のどれかを 入 れる 1. I visited Nara ( in ) We practice soccer ( on 3. Ben gets up ( at 4. I was born ( on ) Wednesdays. ) six every morning. ) January 2nd. 5. We studied English early ( in 6. We have much snow ( in 7. There are thirty days ( in ) winter. ) the morning. ) November. 20 英 語 特 別 講 座 代 名 詞 前 置 詞 形 容 詞 助 動 詞 #20 形 容 詞 と 副 詞 形 容 詞 1 名 詞 を 修 飾 する I bought a new desk. 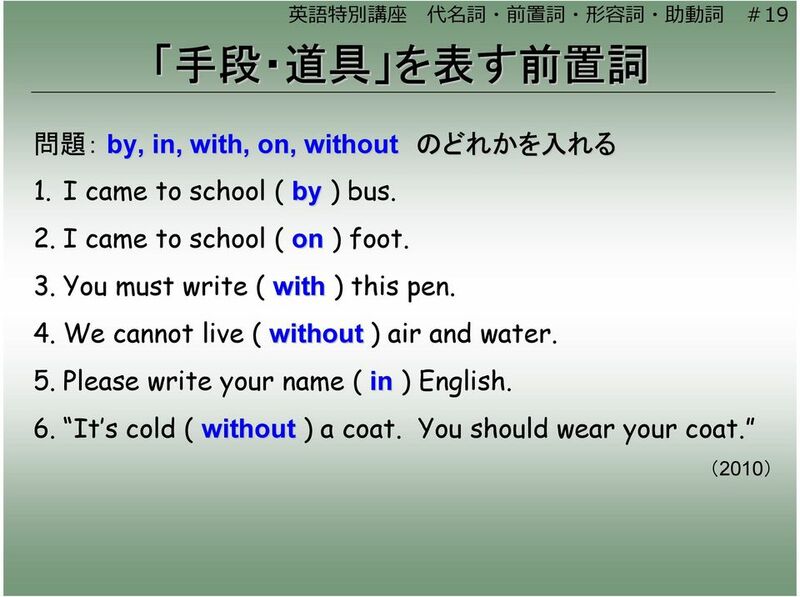 2 代 名 詞 を 修 飾 する I want something cold. 3 主 語 の 説 明 をする I am busy. This book was interesting. 副 詞 1 動 詞 を 修 飾 する I can run fast. He can play soccer well. 2 形 容 詞 を 修 飾 する I was very busy. 3 副 詞 を 修 飾 する He plays soccer very well. 24 英 語 特 別 講 座 代 名 詞 前 置 詞 形 容 詞 助 動 詞 #24 意 味 をもつ 助 動 詞 ~できる ~できた ~でしょう ~するつもりです ~しなければならない ~する 必 要 がない ~するべきだ ~してもよい 私 が~しましょうか が 一 緒 に~しましょうか に can, be able to ~ could, be able to ~ will be going to ~ must, have to ~ don t t have to ~ should may Shall I ~? Shall we ~? 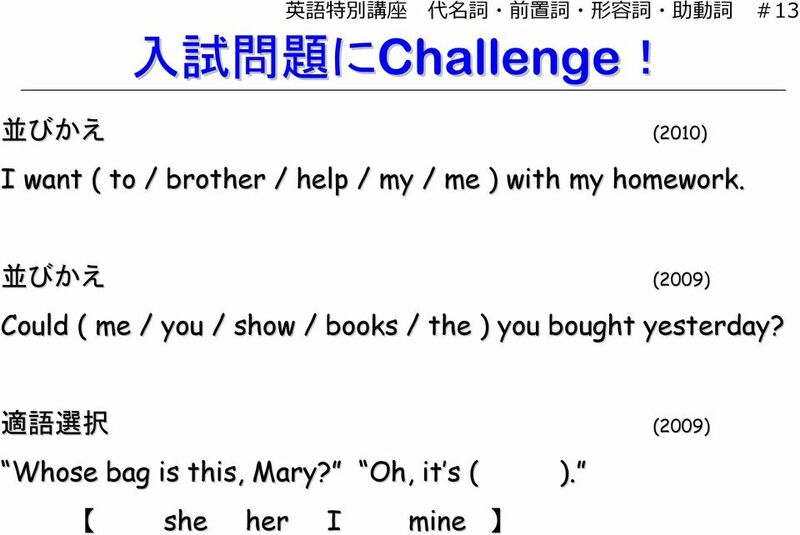 25 英 語 特 別 講 座 代 名 詞 前 置 詞 形 容 詞 助 動 詞 #25 入 試 問 題 にChallengeに Challenge! 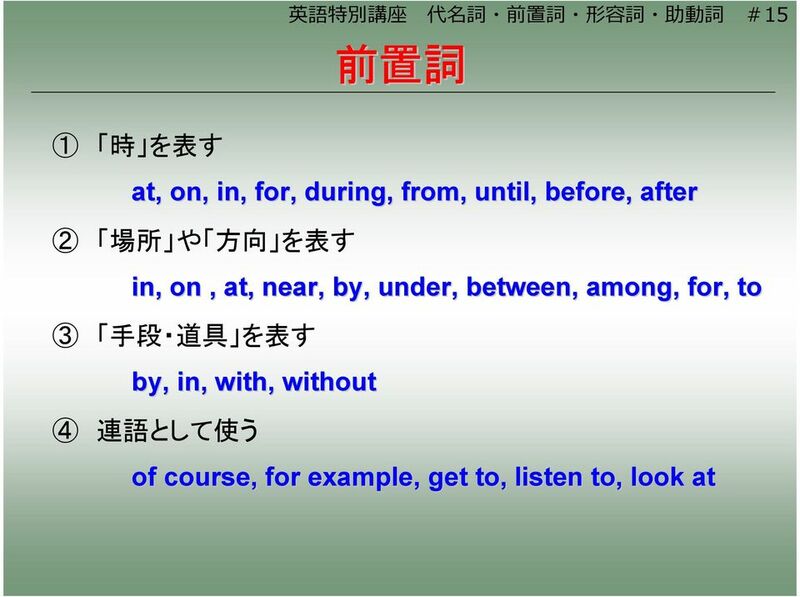 並 びかえ ( ) I ( know / all / it / don t t / at ). 条 件 英 作 文 ( ) 彼 がどこに 住 んでいるかたずねるとき( 英 語 4 語 以 上 で) 条 件 英 作 文 ( ) 電 話 でリサと 話 したいとき( 英 語 4 語 以 上 で) Hello, this is John. Lisa? 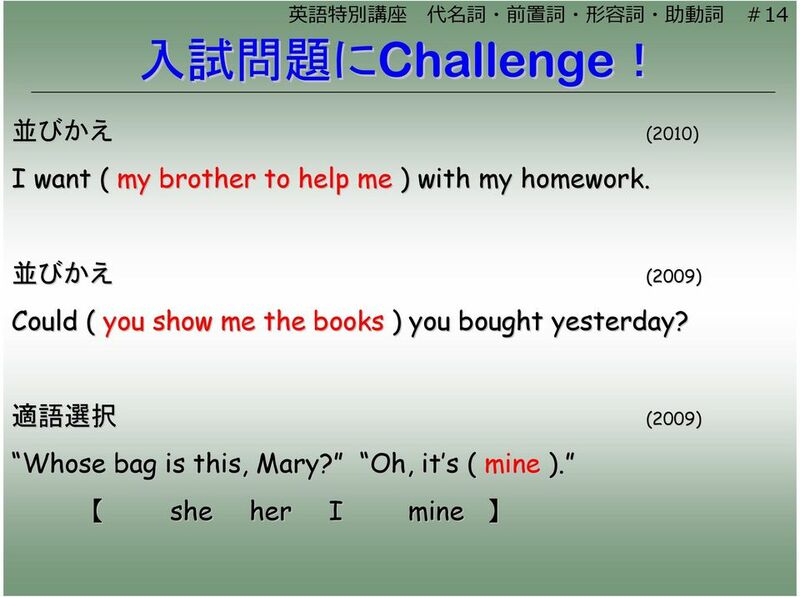 26 英 語 特 別 講 座 代 名 詞 前 置 詞 形 容 詞 助 動 詞 #26 入 試 問 題 にChallengeに Challenge! 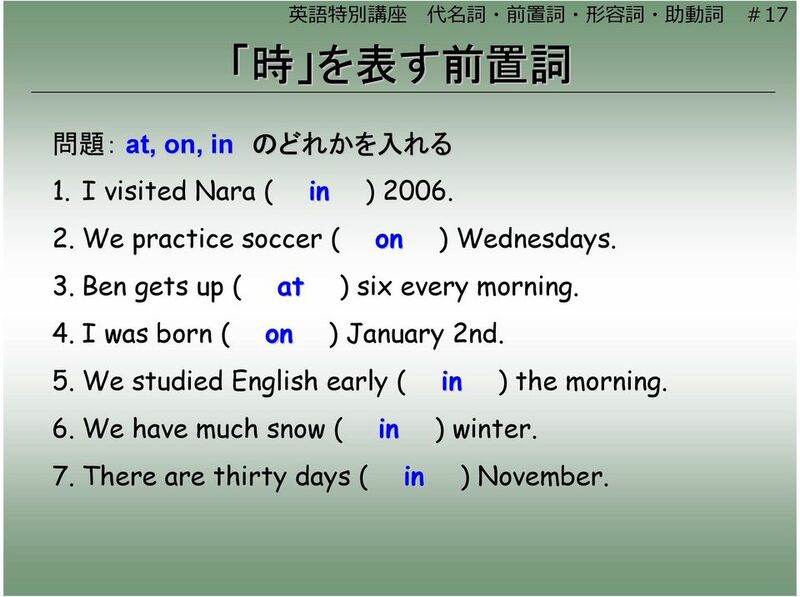 並 びかえ ( ) I (don t t know it at all ). 条 件 英 作 文 ( ) 彼 がどこに 住 んでいるかたずねるとき( 英 語 4 語 以 上 で) Where does he live? 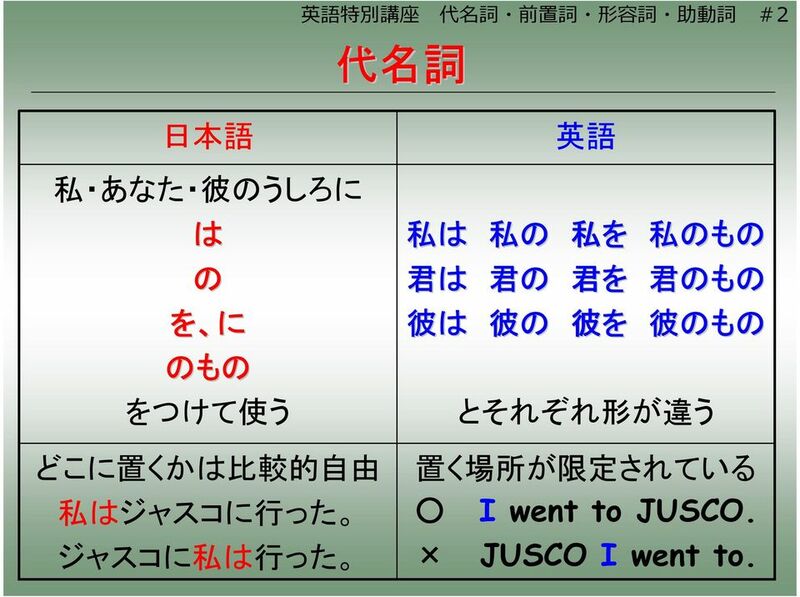 条 件 英 作 文 ( ) 電 話 でリサと 話 したいとき( 英 語 4 語 以 上 で) Hello, this is John. May I speak to Lisa? ( 法 ) 助 動 詞 って?